If you are selling your house, there could be many factors that affect how quickly you sell it and how long it remains on the market. And sometimes, taking too long to sell it isn’t an option. You may need it to be out of your hands extremely quickly because of job opportunities, deadlines, or other factors. Fortunately, there are several things you can do in order to make your house appeal to someone who is potentially interested in it. Especially for families, it may be difficult for them to see their family in your home when there are so many aspects of your home that may not catch their attention. Financial experts and professional home sellers often say that the key to selling your home rapidly is to declutter the area. This could include many categories. Taking down personal decorations like religious items, political propaganda, and family photos can help with this decluttering. Something else that helps would be to remove or hide pet items. Nothing is less appealing to a new home buyer than seeing pet paraphernalia littered around your home and smelling pet odors that you’ve gone nose blind. These are just some of the many things you can do to increase interest in your home. Another way to attract more buyers to your home is to update the interior and exterior. This could include adding more shrubbery to the front of your home to increase curb appeal, and slapping on a fresh coat of paint to the walls within your house to keep them updated, fresh, and clean. Renovating your kitchen is easily the best way to increase the value and allure of your house. In conjunction with this, replacing or updating your floors can also have a massive effect on how quickly your house sells and how much it goes for when the sale is made. But financial restrictions might now allow you to take on this project. Especially with flooring, it is extremely costly to update. No matter what kind of flooring you want to replace, it can put a dent in your wallet, and when you are trying to move, that is not the best option. But there is a better way to update your floors without replacing them and turning your house into a construction zone. The most common type of flooring is ceramic tile, and it is incredibly easy to rejuvenate and make your home look as though it is brand new without replacing it altogether and spending a fortune on it that you do not have. What people do not realize about tile is that it is incredibly easy to care for. That is why it is so common in residential and commercial locations. Spilling something on ceramic tile does not have the same effect as spilling something on a wooden floor does. When coming in contact with moisture, this will cause the wooden floors to bow and bend because of the quick absorption. This can turn your beautifully expensive wooden floors into a horrible nightmare. With tile, you don’t have this problem, but sometimes the grout can fall prey to such things as spills, dirt, and unwanted grime. That’s why tile and grout cleaning is the perfect solution to restore your tile. If you’ve been living with the same tile flooring for years, you may be surprised to find out just how dirty your tile and grout has become. Simply walking across your floors could even cause your grout to take on an unsettling odor. A deep tile and grout cleaning in Scottsdale is exactly what you need in order to clear away the years of grunge and the dirty tint your tile and grout has developed. Simply doing this could lead to a speedy sale of the house you are trying to leave. Lucky, Desert Tile and Grout Care can perform this exact service for you. We have the tools and knowledge necessary in order to get your tile back to its original, beautiful state without you having to spend ridiculous amounts of money. We can restore the balance of your home and help you sell it quickly with our library of services. From tile and grout cleaning, to bringing back the colorful nature of your brick pathway or fireplace, Desert Tile and Grout Care does it all. So don’t wait another moment. 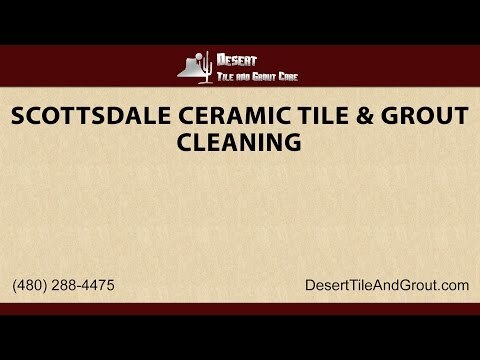 Give us a call at (480)-288-4475 or visit our website at DesertTileAndGrout.com for more information about our excellent tile cleaning services in Scottsdale.